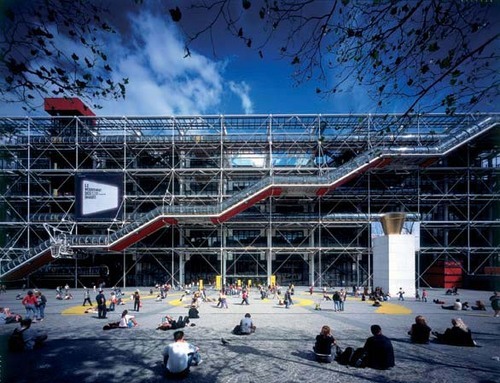 In the 1970′s architects Renzo Piano and Richard Rogers, both unknown at the time, collaborated and erected one of the most famous and radical buildings of our time, Centre Georges Pompidou. The cultural center in Paris, France turned our world inside out, literally. It all began with Georges Pompidou, President of France from 1969 to 1974, who wanted to construct a cultural center in Paris that would attract visitors and be a monumental aspect of the city. Receiving more than 150 million visitors since is completion thirty three years ago, there is no doubt that Pompidou's vision became a successful reality. 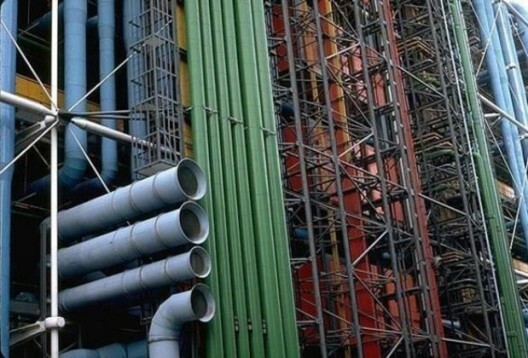 More information on Centre Georges Pompidou after the break. In order to choose the architects for the project, the president held a competition and many entered, including some of the most famous architects in France at the time. People were astonished, however, when the design of Renzo Piano and Richard Rogers, both not famous at the time, won the competition. Their entry exemplified constructivism and was a high-tech modern cultural center structured with a system gerberettes and trusses unlike anything seen in the architectural world before. 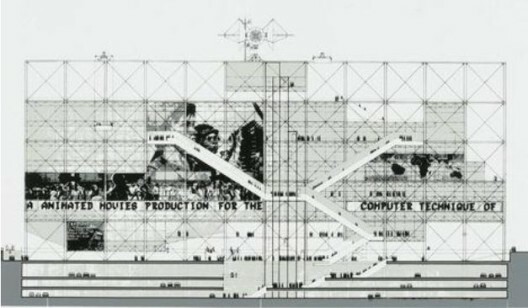 Their concept, depicted in one of their competition drawings as a collage, was portraying the museum itself as movement. The other concept in their design, and perhaps the most obvious, was exposing all of the infrastructure of the building. The skeleton itself engulfs the building from its exterior, showing all of the different mechanical and structure systems not only so that they could be understood but also to maximize the interior space without interruptions. The different systems on the exterior of the building are painted different colors to distinguish their different roles. The structure and largest ventilation components were painted white, stairs and elevator structures were painted a silver gray, ventilation was painted blue, plumbing and fire control piping painted green, the electrical elements are yellow and orange, and the elevator motor rooms and shafts, or the elements that allow for movement throughout the building, are painted red. One of the "movement" elements that the center is most known for is the escalator (painted red on the bottom) on the west facade, a tube that zigzags up to the top of the building providing visitors with an astonishing view of the city of Paris. 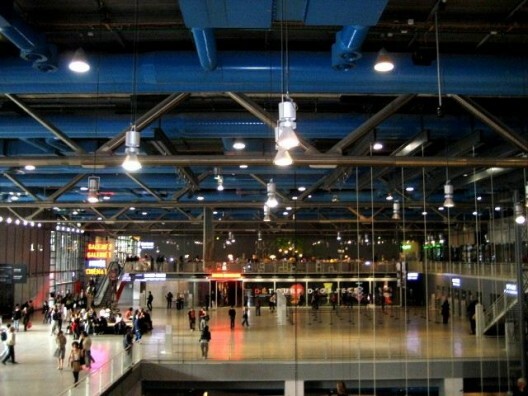 The Centre Pompidou houses the Musée National d'Art Moderne, which is Europe's largest museum for modern art. Also located in the vast open interior is the Bibliothèque publique d'information, a huge public library, and a center for music and acoustic research known as IRCAM. The flat open site upon which it is located is a constant exterior stage for urban events. The centre was officially opened on January 31, 1977 and has since then integrated high-tech architecture and urbanism as a movement and spectacle for the city to experience everyday. 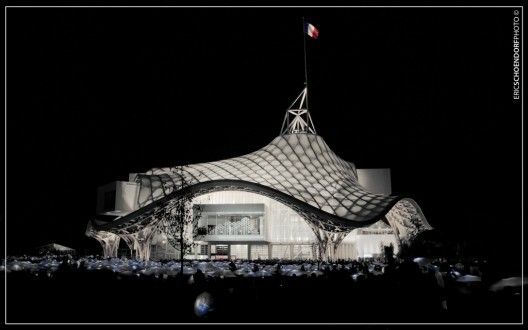 On May 12, 2010 the sister of Centre Georges Pompidou, named Centre Pompidou-Metz, opened its doors in Metz, France. The building was designed by Shigeru Ban and Jean de Gastines. The building is a museum for modern and contemporary art and was designed to resemble a traditional Chinese hat, forcing function to follow form. It incorporates innovative carpentry in its structure composed of sixteen kilometers of glued laminated timber that intersect to form a hexagonal mesh. For more information on the new center visit the Centre Pompidou-Metz official website.